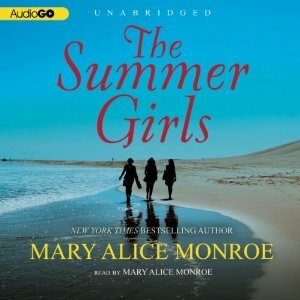 The Summer Girls written and narrated by Mary Alice Monroe was well worth the listen and I will be eagerly listening to the next two in this trilogy. It is about three girls - half sisters, and their grandmother - Mamaw. They have all been invited to her house for the summer, and with a somewhat tentative approach they all end up responding to the invitation. Eudora (Dora) is the oldest and has a young son who is autistic. She is in the process of seeking a divorce from her husband. Carson has turned up from California where she has just lost her job. Harper is the youngest, and works as an editor in her mother's firm. While the girls did meet up for summers when they were young, they are not particularly close. Perhaps this summer that will all change. This story is mostly about Carson, she is a keen surfer and enjoys being out on the sea, until a chance encounter changes things up a bit for her. She also befriends Nate and helps him to learn to swim. Together they befriend a dolphin, that will have far reaching consequences. Carson also forms a relationship with Blake, a keen kite surfer and who also works on tracking the local marine life in this area. A bond forms between Carson and Blake, although it is not really centre stage. The story is more about how Carson is faced with her past and present and must decide how she is going to move into the future. I liked all the characters, Mamaw was a wonderful southern character, the girls were all different and each had their flaws and strengths. I look forward to reading the next two books to find out the developments. There is an environmental message to this book, it is not tacked on, but rather becomes very integral to the plot. I liked the way it was done and it is an important message. I also liked Mary Alice Monroe narrating the book, sometimes I shy away from an author reading their own book, but it works well on the whole. This is one author read audio that I don't hesitate to pick up. I'm glad you enjoyed the audio version. I read the book and loved it. I don't think I've read this author, but it sounds like something I'd like. I put it on my GR list. I used one of my credits and will be using two more on the following two. Kind of women's fiction I enjoy. Gentle southern.